Shampoos commonly have sulfates in them. So do other common products like laundry detergents and floor cleaners. However, there is absolutely no parallel between your hair, floor or clothes. If you’re looking for sulfate-free dandruff shampoos, then you have likely realized how hard it can be to find shampoos without it. We have answers to all your questions and give you the definitive list of the best sulfate-free dandruff shampoos. A hugely popular sulfur-based shampoo that is very effective against dandruff, psoriasis. A gentle formula that deals with all the major hair problems without costing over the top. A superb product with an excellent track record and barely any flaws. We’ll first begin by exploring all that you need to know about sulfates in shampoos. What Are Sulfates From The Context Of Shampoos? Why Are Sulfates In Shampoos Frowned Upon? Are There Any Risks Pertaining To Sulfates In Shampoos? How Is the Function of Sulfates Replaced In Sulfate-free Dandruff Shampoos? Sulfates are used in shampoos in the role of surfactants. Surfactants are chemical chains or compounds that are designed to help remove contaminants like dirt and grime from a particular area, whether it is floor, clothes, or your hair. Etymologically (root of a word), you can trace surfactants to “SURface” “ACTing” “ageNTS”. The majority of surfactants are sulfates. The process through which surfactants clean is simple. One side of long molecular chain attaches with oil or grime while the other is repelled by water. Therefore, when you rinse, the water actually repels the shampoo and grime combination out of your hair. While there may be an infinite number of sulfates, the most common in dandruff shampoos are Ammonium Laureth Sulfate (ALES), Ammonium Lauryl Sulfate (ALS), Sodium Laureth Sulfate (SLES), and Sodium Lauryl Sulfate (SLS). SLS and ALS are the strongest of the group. There are two reasons why people tend to avoid sulfate-based shampoos. The first can be traced back to the 1970s. In that decade shampoo manufacturers decided to incorporate Ethanolamine Lauryl Sulfates (ELS) into their formulae. ELS, particularly, is carcinogenic because it releases nitrosamines. This resulted in sulfates getting a bad rep which they’ve been unable to shrug off since. While modern-day sulfates in dandruff shampoos are not perfect, they’re not carcinogenic like many would have you believe. In fact, the carcinogenic properties of sulfates are overly inflated in the current environment. Not a single sulfate used in shampoos is carcinogenic by any stretch of the imagination. However, this doesn’t mean that you should start using sulfate based shampoos. Sulfates still cause damage. Just not at the scale of cancer. So, the big question is what risks do sulfates in shampoos pose? Sulfates in shampoos of today won’t create massive health problems for you. All they’ll do is affect your hair and scalp in ways that you may not appreciate so much. Let us explain. Sulfates are basically cleansing agents. Their job is to clear your scalp of unwanted buildup. This includes everything from dirt to dead skin cells or even excess sebum (oil produced by your skin). However, when sulfates do this, people sometimes end up with excessively dry hair. Imagine losing all oil from your scalp. It would only be natural for your hair to feel too dry. Also, excessive dryness leads to its own problems such as dandruff, flaking, and itchiness. In such a scenario, sulfates may make worse or even cause problems as against resolving them. On the flip side, if you have an overactive system, your skin or scalp may overcompensate for this excessive stripping of oils by producing even more body oil. The direct result can be extra oily hair. Therefore, you can say that sulfates can result in either excessively dry hair or overly oily hair. The bottom line here is that if you have dry hair and skin or flaky scalp, then you should avoid sulfate-based shampoos. However, one thing you should be mindful of is that sulfate-free dandruff shampoos may not create the same kind of lather and foam that you’re used to from more mainstream shampoos. How Is the Function of Sulfate Replaced In Sulfate-free Dandruff Shampoos? Tea Tree: Tea tree oil is very popular when it comes to active ingredients dandruff shampoos mainly because of its anti-infective properties. It can combat all types of infections including fungal and bacterial. Aloe Vera: Aloe vera is a very soothing and calming active ingredient used in all types of natural products. In addition to calming, it is rejuvenating, can repair damaged hair, and even promote hair growth. Eucalyptus: Eucalyptus is a lot like tea tree. It is also an anti-infective in the same mold. Argan: Argan oil is extracted from argan tree kernels and is useful for its moisturizing, cleansing, and reparative properties. Jojoba: Because of its moisturizing properties, jojoba oil is used as a good supplementary alternative to sulfates. Coconut: Coconut oil has been the go-to option in traditional cultures for dealing with all types of hair problems. It moisturizes, cleanses, rejuvenates, and heals damaged hair. Even though the above sulfate alternatives are effective, one thing they cannot reproduce is the kind of lather and foam that you’re used to from more mainstream shampoos. Unfortunately, many people have this misconception that no foam and lather means no cleansing. This isn’t true as you’ll see with many of the following nine shampoos. You should also remember that if one sulfate-free dandruff shampoo formula doesn’t work for you, another will. This is why we recommend being patient with your quest of having a simultaneously sulfate-free and dandruff free life. 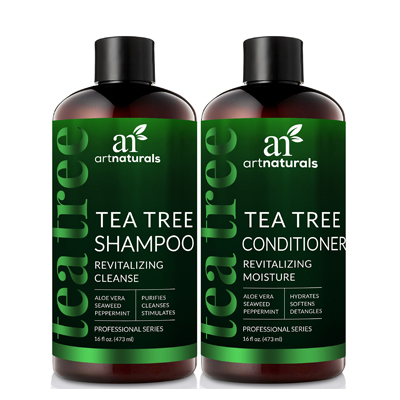 This shampoo and conditioner set from the hugely environment-conscious company, Art Naturals is based on a combination of tea tree oil, aloe vera, seaweed, peppermint, and a number of other naturally occurring ingredients. While tea tree oil or aloe vera alone would’ve been enough, their combination and the inclusion of other similar ingredients makes this set excellent for people suffering from dandruff and dry, flaky scalp. 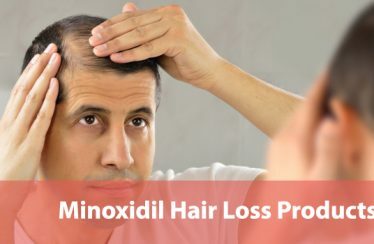 Between these ingredients, the shampoo formula does not only counter infections and dandruff but also boosts hair re-growth, if you’re suffering from hair loss too. While the hair re-growth benefits of this shampoo-conditioner set aren’t questionable, in some instances, some users claim that they haven’t seen them. However, since hair re-growth is a very slow process, it is possible that they didn’t persevere with this product. The conditioner and shampoo are intended to be used together and are most effective together than individually. This means that switching to Art Naturals will require you to give up your conditioner brand as well. However, the benefits are there for everyone to see as regular use will leave your hair soft and bouncy. This happens because there are so many moisturizing agents in the formula. Speaking of formula, there are some concerns worth addressing. While some users claim the formula has been changed to include unpronounceable chemicals, others suggest that counterfeiting may be a concern. So, you need to be extra careful about where you buy this product. You can get 32 ounces of this product at about $30. Who’s it for: If you don’t usually hesitate to pay top bucks for top results, then this product’s naturally anti-infective, moisturizing, and healing properties should make it irresistible to you. New formula throws up questions about ingredients. This sulfate-free dandruff shampoo by Kick is one of those few products that boast of nearly 100% success rate amongst their audiences. This also happens to be the only product on our list that is specifically intended for one gender – men. 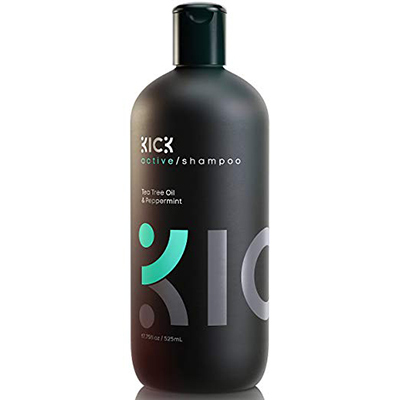 Kick says that this shampoo’s formula has been particularly designed for highly-active men but even women seem to be using it freely. Most anti-dandruff shampoos tend to have mixed results but that isn’t the case with this one. Very few people criticize this product and, when they do, they honestly admit to being nitpicking. This sulfate-free dandruff shampoo is meant to not only deal with dandruff and dry, flaky, and irritated scalps but also heal damaged hair and counter hair loss. While it’s healing and hair re-growth qualities haven’t been proven clearly, its ability to deal with dandruff and dry, flaky scalp exceed expectations. Surprisingly, it even lathers well since shampoos based on natural ingredients don’t normally do that. Further, the scent of this shampoo deserves a mention. It is a mix of tea tree and peppermint but you’ll find the mint to be much more in evidence than tea tree in the scent. A minor flaw of this shampoo is the absence of that tingling sensation in the scalp. Instead, you’ll feel a cooling sensation. This could be because of the fact that the peppermint concentration in this shampoo is very high compared to tea tree. Tea tree shampoos tend to create that tingling sensation but because there isn’t enough of it in there, this shampoo doesn’t. However, within a few seconds of application, you’ll feel chills on your scalp. If you like the peppermint scent and a chilled scalp then you can definitely view this as a benefit but if you don’t then you might see it as a flaw. You might also think that this shampoo is a bit on the expensive side as it is priced above $20 but that is only if you don’t consider the size of the bottle. When you see that you’ll get 17.5 ounces, the cost will seem much more attractive. Who’s it for: If you lead an active life and need something strong to counter dandruff or even itchy, dry, and flaky scalp, then you can’t go wrong with this product from Kick. This is the second shampoo and conditioner set in this list of sulfate-free dandruff shampoos. This one is based on a number of natural ingredients including oils extracted from almond, camelia, jojoba, avocado, and Moroccan argan along with peach extract. This product’s standout quality is its ability to repair damaged hair. This includes everything from excessively thin hair to hair with split ends. In fact, a lot of users even see a marked increase in hair body after prolonged use. Regular use leaves hair soft, silky, light, and bouncy. This shampoo and conditioner set does well with its primary function of banishing dandruff as well. Notably, it does so for men and women both. It is also effective on color treated hair and is mild enough to not strip the color from your hair. The formula in this shampoo is so gentle that some men have used it on their facial hair with excellent results. 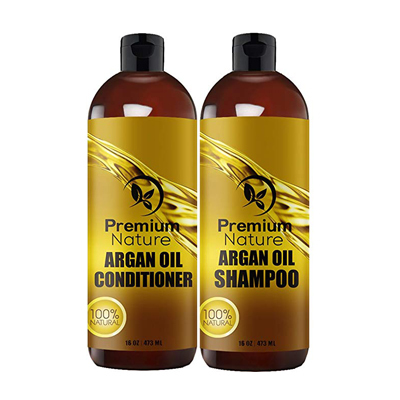 Premium Nature seemed to be trying to promote this product as “salon style” but we aren’t entirely sold on that aspect owing to some of its issues. For one, its scent is too strong and too herbal. Salon style products tend to have very pleasing and calm scents. Further, it doesn’t produce enough lather. The shampoo is clear and slightly yellowish in color while the conditioner is white and creamy. It hasn’t worked for some users, with a minority even complaining of hair loss. Finally, there are some counterfeit issues as well. You can get 32 ounces of this product at about $22. Who’s it for: If you have damaged hair (too thin or split ends) or are trying to deal with dandruff without using chemicals and are open to oily shampoos, then you should definitely try this one out. Scent a matter of preference. It isn’t often that you’ll come across a really outstanding product with negligible flaws. 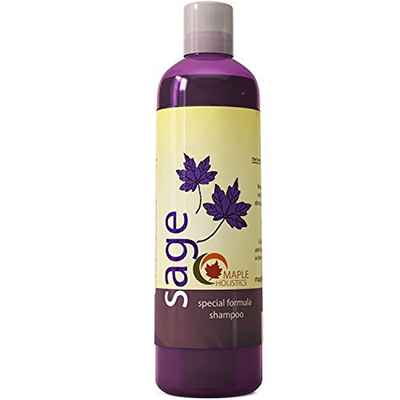 The Sage Special Formula Shampoo from Maple Holistics qualifies. Its primary ingredients are sage, rosemary oil, and tea tree oil. In our opinion, that is the perfect combination. Sage is incredibly effective in promoting hair growth and rosemary helps make the hair thicker and shinier. Tea tree oil, of course, is one of the best naturally occurring anti-infective agents out there. However, Maple Holistics didn’t stop there. They went on to add jojoba and argan oil extracts. These not only strengthen the hair but also make them softer and lighter. It is because of these ingredients that this shampoo comes through on all its promises – dandruff, hair re-growth, and hair thickening. In fact, this shampoo is so effective that it can deal with severe cases of seborrheic dermatitis and you don’t find that very often in natural shampoos. Not only this, users report that after banishing seborrhea’s symptoms with this shampoo, they started seeing signs of new hair! It must be the unique blend of natural ingredients because this shampoo isn’t strong like most “medicated”, “maximum strength” solutions for seborrheic dermatitis. It is gentle enough to be used on a daily basis too. However, if you have extra sensitive scalp and skin, you might want to go for something even milder. People with skin sensitivity issues have reported adverse effects such as excessive dryness and even some irritation after using this shampoo. The smell of this shampoo is a combination of its ingredients. It is kind of woody, earthy, and rustic which means that it may not appeal to everyone. If you’re not down with earthy herbal scents, you may not like this. Who’s it for: If you don’t have an issue with earthy, herbal scents and are looking for 360-degree solution for your hair, this product from Maple Holistics is just the thing you need. Just because you like your shampoo to lather doesn’t mean you have to give up on sulfate-free dandruff shampoos. There are options out there for someone like you and this shampoo from Puracy is the best of the lot. Despite being a sulfate-free dandruff shampoo, it still lathers well because it contains a slew of coconut based cleansers. 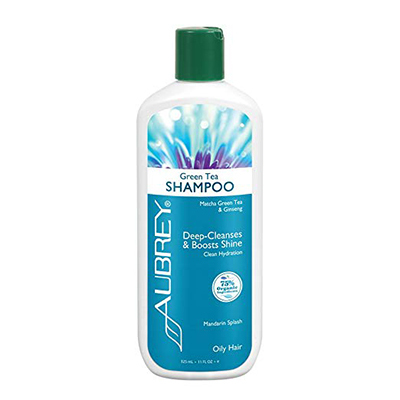 This allows this shampoo to be an incredibly effective hair cleanser. Additionally, it contains a number of nourishing and rejuvenating ingredients, which allows it to strengthen your hair too. Despite the diversity of ingredients used, the proprietary formula is particularly mild and gentle which makes this shampoo a great option for people with sensitive skin. In fact, along with its lathering capabilities, its suitability for sensitive skin is probably the foremost quality of this shampoo. The mildness of the formula has allowed many people to start using this shampoo as a body wash with great effect. It is also children friendly, pet-friendly, contains no parabens, and cruelty free too. While the shampoo is great for most hair types, it might not be ideal for oily hair. It has a tendency to coat the hair, which can make it feel oily. After a wash it might make your hair oily and if you started with oily hair, then greasy. The scent of this shampoo is predominantly eucalyptus tinged with peppermint and citrus. The smell of eucalyptus is definitely an acquired taste and may not appeal to many people. The durability of the packaging has also been criticized quite a bit owing to leakage reports. Who’s it for: You can’t go wrong with this shampoo if you have extra sensitive hair and skin. Despite the name, Tru Moroccan, this shampoo isn’t coming to you from Morocco. The brand name is only a reference to the fact that argan oil originated in Morocco. 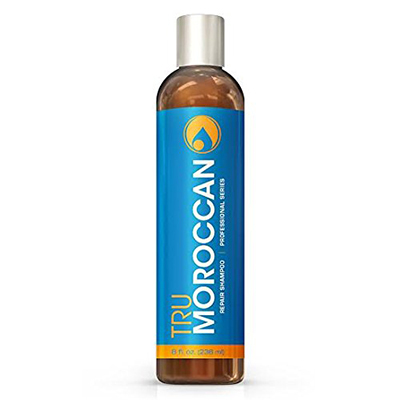 Tru Moroccan products are based primarily on argan oil as is the case with this shampoo. Don’t be thrown off by the fact that this shampoo isn’t marketed as a dandruff shampoo. Even though it is only marketed as a “repair” shampoo, it has proven to be very effective against dandruff with some users explaining saying this is the only product that worked for them. As good as this shampoo is against dandruff, it is even better at repairing damaged, frizzy, or dry hair. There are even reports of this shampoo repairing hair damaged by psoriasis, which is saying something. The reparative claims of this shampoo are quite valid and accurate. You don’t have to worry about your hair type as it works for most, if not all. The shampoo is excellent on grey hair and even chemically treated hair. It is supposed to be great for color treated hair too and for the most part, it is. However, a few users do say that it strips their hair color. The shampoo is mild and gentle. It nourishes the hair on the back of the fortifying and moisturizing qualities of argan oil. In practice, after wash, you’ll find your hair to be very soft. One of the standout qualities of this shampoo is its smell. The smell is nothing short of excellent. It is similar to fresh citrus but has a bit of sweetness to it too. The product is all natural. It is free of parabens and cruelty free as well. The company even focuses on the user experience. They’ll send you an email containing instructions on how to use this shampoo quickly after you place your order to ensure proper results. That being said, it might make your hair too dry, if the formula doesn’t suit you. A lot of people recommend using a moisturizer to resolve this problem. The consistency of the shampoo can also be criticized as it is watery and thin. This leads to the problem of insufficient lathering. Who’s it for: If you’re a big fan of argan oil and need something particularly gentle to repair damaged hair, you should give this one a go. 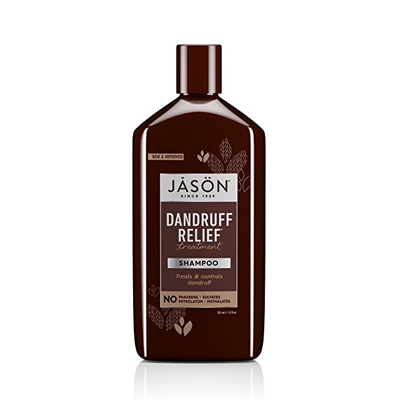 As far as sulfate-free dandruff shampoos go, this Dandruff Relief Treatment Shampoo from JASON is quite popular but there’s a catch. It does what its name suggests – resolves dandruff and takes away symptoms of conditions such as psoriasis and seborrheic dermatitis. It is very efficient at it too. In fact, it is so good that people treat it as a direct replacement for Head & Shoulders and Selsun. The catch, however, is its active ingredients – sulfur and salicylic acid. There’s nothing wrong with salicylic acid but sulfur can leave behind a smell that many of you may be unable to tolerate. The smell has a tendency to stick around too. It doesn’t dissipate with time. Even though this shampoo isn’t all-natural, it still does its job well and without any side effects. None of its countless users have reported any kind of negative reactions. Its formula also contains olives, jojoba, and rosemary oil. Olives and jojoba in the formula mean that the shampoo leaves hair soft after wash while rosemary oil performs the function of pH balancer. The shampoo is also surprisingly gentle and mild enough to be used on color treated and keratin treated hair. It is a viscous shampoo that creates plenty of lather for those of you who need the right amount of lather. It is also free of parabens and phthalates while being completely cruelty free. Some people have found the new formula to be less effective than the older formula but every time a brand changes its formula there are detractors of this type. A bigger concern is reports of counterfeit products. Who’s it for: If you’ve tried everything else to deal with dandruff, seborrheic dermatitis, or psoriasis without success, then this shampoo may be just the answer you need. This is a clarifying shampoo that is based around matcha green tea and ginseng. Clarifying shampoos are particularly capable of dealing with grime, grease, and gunk in hair that could be a result of infrequent washes or excessive use of hair products. This also means that this is a very strong shampoo. This strength could be too much as well. Clarifying shampoos often roughen up the hair by disturbing the pH balance of the hair. The best way to get around this is by using a good conditioner or moisturizer after this shampoo. It is advisable to do so with all clarifying shampoos. Even so, what you can be sure of, though, is “squeaky clean” hair after your washes. There’s a downside to this as well. The strength of this shampoo limits it to only oily hair. Using this shampoo in other types of hair may result in them getting too dry. This will, in turn, cause itchiness, flaking, and dandruff. The shampoo is nothing short of miraculous for oily hair, though. The excess oil in the hair counters the strong nature of the shampoo and vice versa, resulting in just the right balance. The cleansing properties of this shampoo are a result of the ginseng in the formula which also makes the shampoo anti-bacterial. Matcha green tea, on the other hand, offers multiple hair strengthening qualities. It helps counter dandruff, brings down inflammation, and ensures that nutrition reaches your hair follicles by increasing circulation in the scalp. 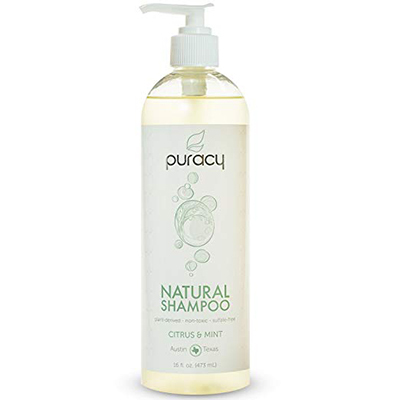 The shampoo formula is not only free of sulfates but also parabens and phthalates. The company also promises that the shampoo is vegan and completely cruelty free. The shampoo’s consistency is watery, which surprises a lot of first-time users. Despite its thin nature, the shampoo lathers quite well. The folks at Aubrey Organics don’t seem to be worried about it since they’re offering a rare two month money back guarantee on their product. Who’s it for: If you use a lot of styling products or don’t wash your hair for days, then this is the perfect shampoo for you. Salicylic acid is beneficial for the hair in two ways. The first is that it prevents oil buildup in your hair and the other is that it prevents dandruff and scalp flakes from developing. However, its inclusion means that the shampoo is not completely natural. 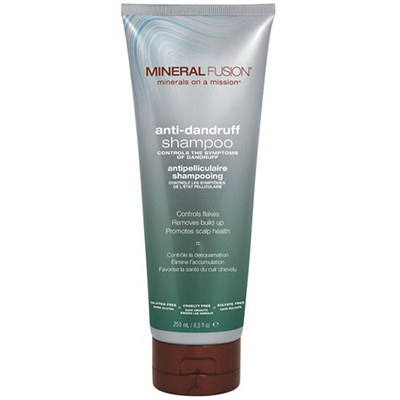 Mineral Fusion anti-dandruff shampoo’s formula is based on 2% salicylic acid. This shampoo also contains some key naturally occurring ingredients such as marula oil and peppermint oil along with a series of minerals. Along with keratin protein, these ingredients nourish and strengthen the hair. Despite not being completely natural, this shampoo is still very gentle. This means that it is suitable for all hair types including color and chemically treated hair. The shampoo is also free of parabens and 100% vegan. Even people with sensitive skin and scalp will find this shampoo to be a good fit. Owing to its gentle nature, this shampoo will leave your hair soft and silky after a wash and will only get better with every subsequent wash.
You won’t have trouble washing your hair either. Unlike other shampoos with natural ingredients, this one lathers very well. In fact, it produces such great lather that people with the thickest of hair have benefitted from it. While there isn’t a lot that is wrong about this shampoo, the odd complaint about hair too dry or hair with residue isn’t uncommon. A more consistent complaint is the thin and watery consistency of this shampoo. This can keep you from feeling like you’ve washed your hair so it’s worth considering. Who’s it for: If you’re not too picky about your shampoo being all-natural and need something that is extra-soft, then this shampoo will be a good choice.